The 3rd generation MD 7.5mm f/4. Note the special cap made of metal which actually screws into the front of the lens, ensuring it never comes off in the camera bag. It even has a rubber lining around the edge of the cap that protrudes below the metal thread, protecting the exposed front element from scratches when removing or replacing the cap. A late MD series lens, this is my most recent purchase and one that I had coveted for some time. It provides true 180 degree coverage in all directions, and projects a circular image 22mm in diameter onto the film plane. The 7.5mm is of course a non-corrected lens, resulting in the lens exhibiting severe barrel distortion, which gives photos taken with it that “Fisheye” look. Lines that are through the middle of the lens (radial lines) remain undistorted, but as these lines get closer to the edge the distortion becomes extreme. 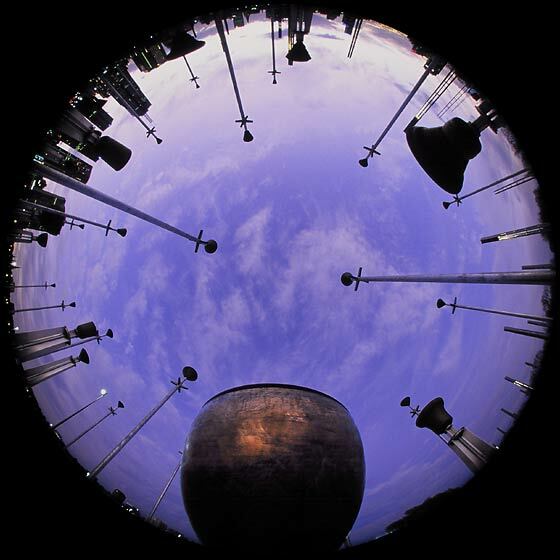 This photo of the bells at Birrarung Marr, Melbourne's newest city garden graphically demonstrates the 180 degree coverage of the lens. 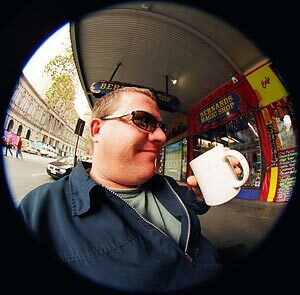 The late MD Fisheye was a continuation of the original design developed in the MC era, and incorporated the changes of the MD era, such as the minimum aperture lock and the maximum aperture confirmation post (used by the X-600 camera for focus confirmation). 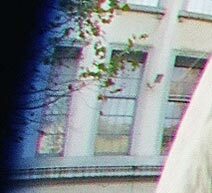 The inclusion of the focus confirmation post is interesting, given that this lens is actually fixed-focus. The lens can be made fixed-focus due to the incredible depth of field inherent in the 7.5mm focal length. The lens is actually focused at 1.2 metres (4 feet), however at f/4 everything from 40cm (1.5 feet) to infinity is in focus. This minimum focus distance reduces even further to only 16cm at f/22!! Remember, this is the distance to the film plane, not to the front of the lens! 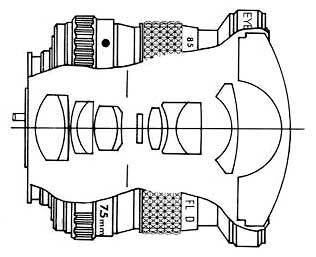 The design of the 7.5mm fisheye comprised 12 elements in 8 groups, and was unchanged throughout the history of the lens, unlike most others within the Minolta range which underwent significant change over the years. The lens incorporates 6 built in filters being Red (R60), Yellow (Y52), Blue (80B), light orange (85), pink (FL-D) and Skylight (1A). These are changed by simply grasping the ring in the middle of the lens (looks like a focus ring) and twisting to the desired point as indicated on the ring. As a professional quality lens, and very expensive new, the build quality of this lens is higher than that of many of the other 3rd generation MD lenses. For example, the lens retains a painted metal aperture ring instead of the plastic ring found in most MD lenses. 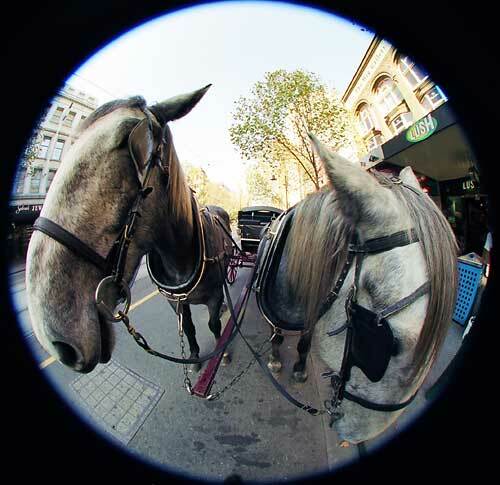 A photograph demonstrating the potential of the lens to distort perspective - I bet you didn't know that horses had heads bigger than their bodies! This can be a lot of fun to play with - I plan to shoot some self portraits next - the prospects are mind boggling! 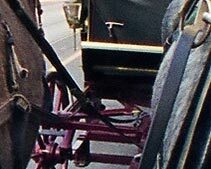 This shot is a 100% crop from the centre of the above image, taken direct from my Kodak lab scan, which is approximately 2200 dpi. It evidences the incredible sharpness of the lens compared against any lens design, let alone a fisheye converter. 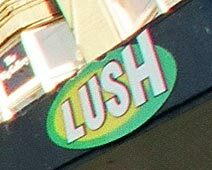 This crop is taken from the very edge of the image (see above, top right) and demonstrates that the sharpness goes right to the edge. I am actually very keen to shoot some fine grained film like Velvia and have it scanned at 4000 or 5400 dpi to really see the capabilities of this lens. I suspect that it is sharper than can be resolved by the scanner used by my lab. I included this shot because it shows a couple of minor flaws with the lens, firstly the blue tinge at the very edge of the image, and secondly some chromatic aberration (on the horses nose). Personally, I don't find the blue edge to be a major concern, and it can be easily removed in photoshop if required. Chromatic aberration is evident in many super-wideangle lenses, and accordingly I was not surprised to find it, however it seems much greater in this photo than the others I took. Personally, I can live with it. Ok, so now you are keen to get a 7.5mm fish-eye, and all you need to do is save up the small fortune required to invest in one. However, before you run to the bank, I should bring your attention to one important consideration. It can be very hard to take a good photo with this lens. Why? Well for starters, everything looks so far away! In this shot (my first with the lens) you can see my two dogs. However, they look like they are miles away when they are actually at my feet! The one at the bottom was literally only one foot away from my leg. He couldn't understand why I was still calling him! What this means is that you really have to get "in their face" to take a portrait of anyone with this lens. When I say "in their face" I really mean it! Meet Luke, my best photo buddy. He doesn't like having his picture taken but couldn't move fast enough to get out of the enormous field of view. In this shot the camera is only about 40cm from his face, and he still looks miles away! For really striking perspective aberration, stop the lens down and shoot REAL close. Also, don't forget that it is very easy to get your foot or tripod legs into the photo by mistake. My tripod (Manfrotto 055PROB) actually allows the vertical column to be removed and placed horizontally. I used this feature to avoid getting the tripod legs in my photos, but it is still something you really have to think about. Just ensure that you run an eye around the edge of the frame before pressing the shutter release. 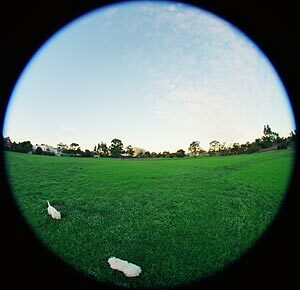 There are a couple of alternatives to the Minolta fish-eye that are available for those on a budget. 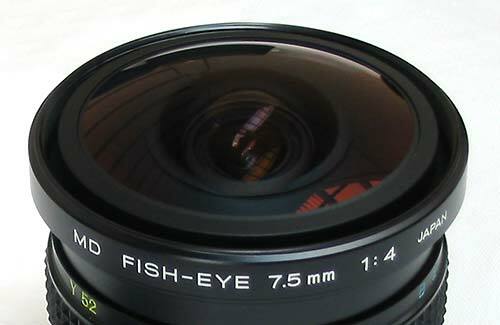 Firstly, there is the Peleng 8mm fish-eye, made in Belarus and incorporating all of the quality that that implies. ;o) I do not recommend this lens for a couple of reasons, firstly, the image circle is larger than 24mm, meaning your circlular fisheye is not quite a circle! Secondly, it is not very sharp, certainly not compared to the Minolta. It is significantly cheaper than the Minolta (approximately $200-$240) so if price is very important it may be a suitable alternative. You can find out more about the Peleng lens here. 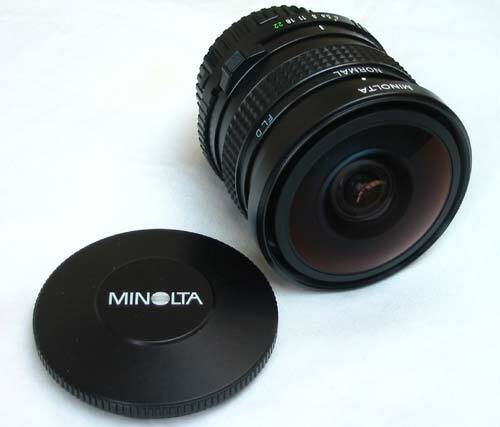 Sigma also manufactured an 8mm circular fisheye for Minolta MD bodies, and in fact they still do for AF bodies. Occasionally one of the old lenses will pop up on ebay, and they can normally be obtained for a reasonable price (US$150-$200). It really is a matter of searching every few days however, and it may be several months before the next one is available. So if after all this you still want a circular fisheye, then go for it - I waited a long time before finding one at the right price, but it was well worth the wait.